And Jackie loves The Bahamas. Jackie Walker, a retired Executive Assistant from the North Carolina Highway Patrol, has been visiting the Bahamas since the eighties and has made over sixty-five trips. She always stays at SuperClubs Breezes and the staff loves her like family. Jackie talks about them like family. We first got to know her when she contacted us through the Bahamian Project’s website to recommend several Bahamians she thought were worthy and deserving candidates. Since then she has sent us many encouraging email messages, and has even become a patron of the Project. So, when she told us that she would be in town, at Breezes of course, we were eager to meet her. She greeted us as if we had known each other for years and introduced us to some of her friends at Breezes, James the security guard, Jerry the entertainer aka ‘Diva’, Mizpah Cox the lovely young bartender, and Hedda Smith the Sales Manager. 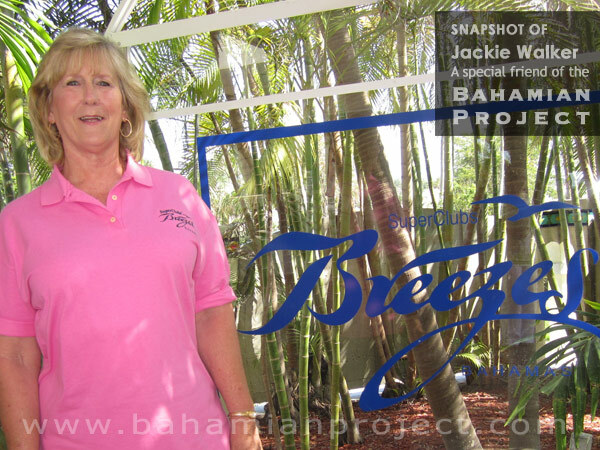 Jackie simply makes everyone around her feel important and special, and she is special to everyone because of it. To us, she has been a spirited supporter and now she is a valued friend.